Preheat the oven to 350°F. Set six 4 to 6-ounce ramekins or custard cups (for Valentines we use heart shaped custard cups) in a roasting pan or deep baking dish. Crack the eggs and separate yolks into a bowl, add the Amaretto, vanilla and whisk. In the top of a double boiler, melt the chocolate. In a large saucepan, heat the half and half, salt and sugar until very hot and then add the chocolate, whisking constantly. Slowly add the chocolate mixture to the eggs while whisking so as to temper the mixture and not cook the eggs. Add the amaretto cookie crumbs and mix. Transfer the custard mixture to a large measuring cup or pitcher and divide evenly among the ramekins. Fill the roasting pan or baking dish with hot water to reach halfway up the sides of the ramekins. Cover the pan tightly with aluminum foil and bake until the perimeters of the custards are just set and the centers are still slightly jiggly, about 35 minutes. Transfer the custards from the water bath to a wire rack and let cool. The custard mixture can be stored in the refrigerator for up to 3 days before baking. Once baked, the custards can be chilled for up to 2 days (although they’re much better when they haven’t been refrigerated). 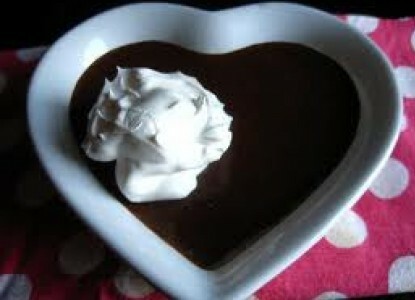 The day before you plan to serve the dessert, in a small saucepan, heat the cream over medium heat just until it boils. Immediately turn off the heat. Place the chocolate in a medium bowl. Pour the hot cream over the chocolate and whisk until melted and smooth. Strain into another bowl, cover, and refrigerate overnight. The next day, remove the mixture from the refrigerator and, using a mixer fitted with a whisk attachment or a hand mixer, whip it into fluffy, soft peaks. Return to the refrigerator. In a clean dry bowl, whip the egg whites until soft peaks form, then add the sugar and continue whipping until glossy and stiff, about 30 seconds more. Fold into the white chocolate mixture, and then spoon the mixture (or pipe through a pastry bag) on top of the Pots de Creme. Keep chilled until ready to prep for serving.